It takes a lot to really surprise an award show audience, but the 2017 Emmys managed to do that Sunday night. Certainly, everyone knew that host Stephen Colbert would lean into some political jokes, but probably no one thought he would actually bring a (former) politician out on stage — Melissa McCarthy Sean Spicer. One of the opening gags of his monologue had Colbert poking fun at the fact that there’s no way anyone will ever be able to figure out just how yuge the Emmy audience is for 2017. Certainly, there’s no way to gauge that, right? Right. 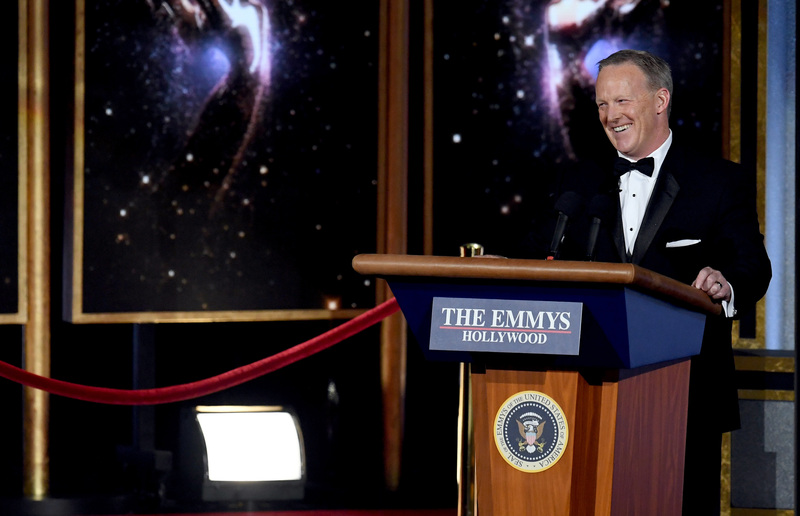 So cue Sean Spicer rolling out an “Emmys” podium to announce to everyone that THIS is the biggest crowd the Emmys has ever seen! PERIOD. The bit was cute, and over before you knew it. BUT OMG, DID THE AUDIENCE EVER FLIP THE F OUT. Just look at Veep’s Anna Chlumsky face, her actual face as he wheeled his podium out. She does not believe any of this is real. Modern Family’s Julie Bowen and Sarah Hyland cannot believe what they’re seeing. 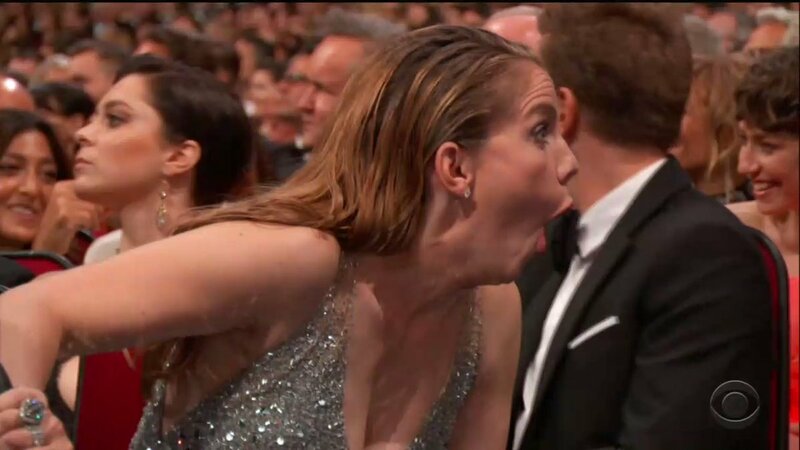 But the real hero of the ~audience shot~ is Melissa McCarthy, who a week ago won an Emmy for Outstanding Guest Actress in a Comedy Series…for her role as Sean Spicer on Saturday Night Live. And of course, the camera kept cutting back to her, because it’s McCarthy reacting to Spicer, a nice ‘lil role reversal from this past SNL Season. Let’s all send McCarthy our good thoughts and vibes, because she’s definitely going to run into the former Press Secretary backstage.